When people abuse dangerous drugs, they are compelled to think and behave in ways they would otherwise not. Sometimes, this can mean engaging in drunk driving or promiscuous sexual activity; sometimes, it can mean taking multiple drugs, doing anything they can to make the artificial sensations of pleasure and wellbeing last. But chasing poison with even more poison creates unimaginable risks. The perils of dangerous drug combinations don’t stop at merely deepening an addiction. Dangerous Drug Combos: What and Why? Of the many dangers caused by combining dangerous drugs, the unpredictability of what might happen is a huge concern. This is because different people react to different drugs in different ways; a person’s family history, medical history, age, gender, living situation, etc. can all come together to produce a reaction to a drug that is unique. Adding another drug to that mix – either simultaneously or when the first drug is still present in the body – can push a user too far in one direction (if both drugs are stimulants, for example), or can give a user brief sensations of each, before causing a breakdown as the body and brain are pulled in two opposite directions. What drives someone to take multiple drugs at a time? The answer lies in why certain drugs compel people to do risky things. Dissociative drugs, for example, cause users to feel disconnected from the world around them. This means that those who take a drug like PCP can experience hallucinations that make spatial and chronological senses distorted. They may feel that time slows to a crawl, and that their immediate world around them is massive and vast. Some users feel as though they are physically invulnerable, that nothing can hurt them; and while in this state, they may feel emboldened to do risky things, like drive while under the influence, seek out strangers as sexual partners, or try another drug while still on the effects of the dissociative drug. Sometimes, this manifests in what is called polydrug use, where two or more drugs are taken at the same time in order to achieve a particularly desired effect. 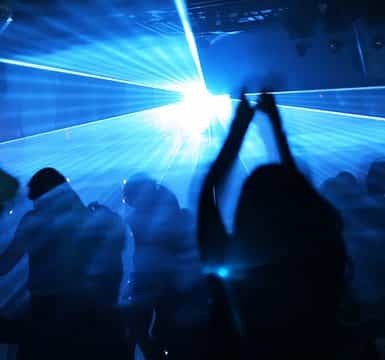 An example of this occurs among users of drugs who are involved with specific social situations, such as at a nightclub, a party, dance venues, or (music) festivals. Methamphetamines tend to be used with ecstasy, cocaine, marijuana, and alcohol, depending on the setting and the individual. In some cases, users seek out precise drug combinations; in others, it is simply a case of supply and demand. Australia’s Department of Health writes that the greater the degree a person is under the influence of a drug, the higher the chance that the person will use multiple drugs to enhance and prolong the intoxicated state. Ecstasy, mentioned above, is one of the most popular choices of drug among people who go to nightclubs and dance parties. Its full name is 3,4-methylenedioxymethamphetamine, or MDMA for short. In 2006, the Journal of Psychopharmacologypublished a report on what it called “the confounding problem” of polydrug abuse among people who use MDMA, and who take alcohol, cannabis, cocaine, and methamphetamine at the same time. According to the journal, these are the most common drug combinations among MDMA users. However, MDMA is neurotoxic, meaning it is a substance that diminishes, damages, or outright destroys the tissues of the body’s central nervous system, causing seizures and even death. Adding to the danger is that methamphetamine and cocaine are both stimulants and by nature are neurotoxic themselves. The Journal of Psychopharmacology warns that taking meth and/or cocaine with MDMA may enhance long-term damage. 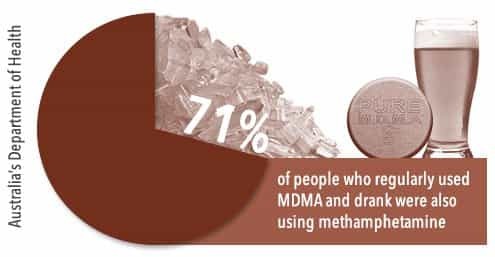 Australia’s Department of Health writes of a study that found 71 percent of people who regularly used MDMA and drank were also using methamphetamine, concluding that it was “highly likely” that excessive alcohol consumption took place with methamphetamines. Similarly, MDMA and cannabis (marijuana) can cause serious neurological damage in a user. Heavy cannabis use in adolescence has been associated with the development of neuropsychiatric disorders, such as cognitive deficiency and reduced IQ.< Furthermore, the presence of cannabis in the system of someone who was also using ecstasy was shown to cause psychological problems and significant impairment in thinking and concentration. Cannabis comes in other discussions about dangerous drug use and combinations. The Addiction journal published the results of a study that found people who used cannabis more than 50 times in a year were 140 times more likely to use other drugs than people who didn’t use cannabis. The writers of the study were quick to caution that while this does raise the risk of cannabis being a dreaded “gateway” drug, the relationship between cannabis and harder substances is noncausal, and does not take into account other risk factors that may influence an individual to combine drugs. However, this method poses extreme risk to the individual, because there is no telling when the effects of one drug wear off and when the effects of the second drug begin. There is no concept of “balance” when it comes to speedballing; the user is much too deeply under the influence of either the heroin or the cocaine (or even both) to moderate consumption. In the end, the user simply loads the body and brain with more and more incredibly powerful substances – one rewriting the brain’s chemistry to speed up, the other rewriting the brain’s chemistry to slow down – until it culminates in seizures, respiratory collapse, or heart failure. The effects on the brain can be so damaging that they might even change the brain. A 2014 study on the structural brain differences of people who were dependent on alcohol both with and without dependence on another drug found that those who were abusing multiple drugs showed different “brain structural abnormalities” to those who were alcohol-dependent but without other substances. Of course, not all opioids are like heroin. Some provide such health benefits to people in physical and mental distress that they are sold legally (if restrictedly) as prescription medication, such as Vicodin and OxyContin. These powerful drugs work by fixing themselves to the opioid receptors in the brain and preventing the brain from receiving pain signals from the central nervous system. While these are effective medications in their own right (leading to drug companies dealing in amounts of $50 billion), they can also be incredibly habit-forming. The people to whom they are prescribed might be in such pain that they unilaterally up their dosage, or they don’t wait until the effects of the first intake of drugs wear off before consuming more, so desperate are they to get some respite. 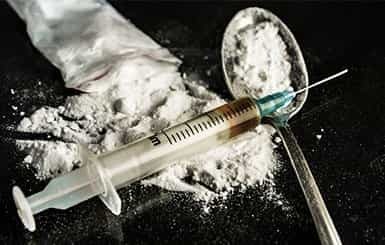 On the other hand, some people cannot resist the urge of using opiates or other prescription medications recreationally, abusing the drug when they have no legitimate complaint, and enjoying the immediate rush of euphoria that settles down into a blissful and powerful drowsiness that makes all their troubles seem far away. 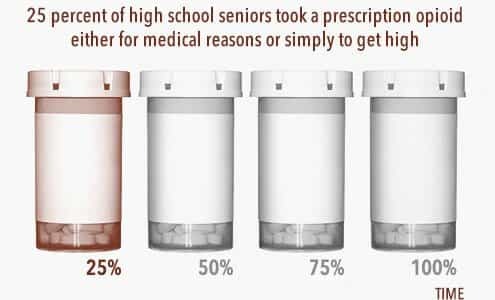 TIME magazine writes that while almost 25 percent of high school seniors took a prescription opioid either for medical reasons or simply to get high, those who took the drugs nonmedically had a higher risk of smoking, using other drugs, or binge drinking. Those who took the drugs for medical reasons did not have such a risk. On the surface, the idea of combining benzodiazepines and alcohol make sense. Alcohol has similar depressant effects to benzodiazepines, making users feel incredibly (if artificially) calm and relaxed. For a person who is at the mercy of chronic pain, doing anything – including combining their medication and alcohol – may seem worth the risk. On the other side of the spectrum are those who merely want to lose themselves in the comfortably numb sensation of a benzo and alcohol, to the point where they may “stack” one substance on top of the other to boost the effects. But benzodiazepines are so effective in how they pause the natural activity of the brain that adding a depressant like alcohol into the mix might go even further in pushing the brain into a fog. People who do this expose themselves to the risk of their vital organs simply not receiving signals from the brain, effectively shutting those organs down. This could culminate in liver or kidney failure, both of which can be fatal. Another danger arises from withdrawal, which describes the physical and psychological effects that happen when people discontinues intake of a drug upon which they have come to depend. Drugs work by triggering the brain to release dopamine, a neurotransmitter that is responsible for feelings of pleasure, wellbeing, and satisfaction. Such sensations come about through a number of healthy pursuits, but opioids, stimulants, alcohol, and other drugs force the brain to pump out dangerously high amounts of dopamine – so high, in fact, that the activities that would normally give a person a sense of satisfaction and pleasure become forgotten and left behind. So distressing are the symptoms of drug withdrawal, that some people actually experience fear of withdrawal itself. A blogger for The New York Times, who wrote about how she stopped taking benzodiazepines for her anxiety, describes the state of panic and uncertainty as she braced herself for the inevitable effects of terminating her lorazepam. Withdrawal, as a process and consequence of drug dependence, is common enough that it is known as w/d among “those in the know,” according to the Times blogger. For that reason, people who abuse both benzodiazepines and alcohol might use one or the other to mitigate withdrawal effects; for example, the alcohol can be used as a sedative during the withdrawal. This may patch over some of the unpleasant sensations (especially the psychological symptoms, like depression and anxiety); but since high amounts of benzodiazepines put a person at risk for respiratory depression (by literally making the brain too relaxed to keep the lungs working), the danger of severe intoxication or fatal overdose as a result of the alcohol consumption climb exponentially. 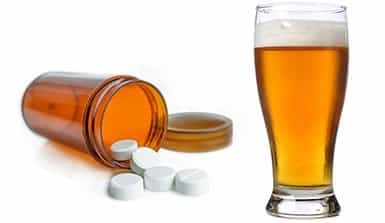 Even though alcohol and benzodiazepines are very commonly abused together (due to both substances being relatively easy to procure), there are many other combinations. The journal of the American Family Physician estimates that upwards of 80 percent of benzodiazepine abuse is carried out with other opioids. On the other side of the spectrum are prescribed antidepressants (that 27 million people, or 10 percent of the American population at the time, took in 2005), which work by preventing the brain from reabsorbing neurotransmitters responsible for feelings of wellbeing and happiness. This is useful for patients who are suffering from depression, panic attacks, obsessive-compulsive disorder, and post-traumatic stress disorder. A large number of antidepressants are manufactured and prescribed as selective serotonin reuptake inhibitors, or SSRIs, although many other kinds exist. When they are given to people, however, they carry a very strong warning that the individual should not consume alcohol with their medication. It might be assumed that since both antidepressants and alcohol improve mood and feelings of wellbeing, taking them together can only lead to an even better mood. In truth, however, alcohol can work against the antidepressant, exacerbating some of the symptoms of the initial depression and putting individuals at risk for then taking even more of the antidepressant and/or the alcohol, since they are unaware of the nature of the interaction between the alcohol and the antidepressant. Alcohol can also increase some side effects that would otherwise naturally occur with antidepressants, like dizziness and problems with movement and concentration. A further complication arises when alcohol is taken with stimulants like amphetamines, which are used in the treatment of attention deficit hyperactivity disorder in prescription drugs like Adderall. Beyond a certain point of consumption, alcohol has depressant effects (fatigue, lack of coordination, and an inability to concentrate). Since amphetamine is a stimulant, it covers those depressant effects, confusing people into thinking that they haven’t drank much; when, in reality, they are still loading their bodies with alcohol. In addition to putting a person at risk for alcohol poisoning, the amphetamines in stimulants can also lead to high blood pressure, irregular heartbeat, and the risk of death. A study conducted in 2010, and published in the Drug and Alcohol Review journal, involved interviews with 72 people who drank energy drinks (most of which contain methylxanthines, a stimulant from which caffeine is derived). 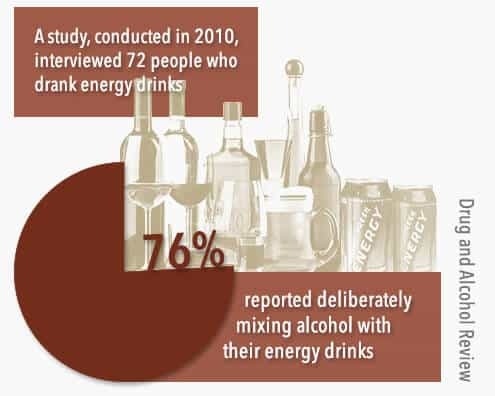 Of those 72 people, 76 percent reported deliberately mixing alcohol with their energy drinks. Contrasted to drinking sessions where energy drinks were not used, people responding to the study reported drinking much more alcohol when it was taken with energy drinks. The researchers concluded that the consumption of energy drinks (powered by stimulants) is associated with higher levels of alcohol use. Combining drugs is a massive, and common, health risk. More than half the people who seek drug treatment, or who are arrested for driving under the influence of alcohol, have another controlled substance in their systems. The Journal of Studies on Alcohol and Drugs writes that there is a high enough occurrence of, and risk for, consequences that come from mixing different drugs and alcohols together, that colleges should focus their substance abuse prevention efforts on dangerous drug combinations. “How Does Combining Drugs Affect Driving?” Accessed November 17, 2015. “Dissociative Drugs.” (n.d.) University of New Hampshire. Accessed November 16, 2015. “7. Poly Drug Use.” (February 2008). The Department of Health. Accessed November 17, 2015. “Neurotoxin.” (July 2015). The MSDS Hyperglossary. Accessed November 17, 2015. “Adolescent Marijuana Use and Vulnerability for Neuropsychiatric Disorders.” (December 2014). Psychiatric Times. Accessed November 17, 2015. “The Confounding Problem of Polydrug Use in Recreational Ecstasy/MDMA Users: A Brief Overview.” (March 2006). Journal of Neuropsychopharmacology. Accessed November 17, 2015. “Does Cannabis Use Encourage Other Forms of Illicit Drug Use?” (April 2000). Addiction. Accessed November 17, 2015. “Marijuana May Be The Least Dangerous Recreational Drug, Study Shows.” (February 2015). The Huffington Post. Accessed November 17, 2015. “Marijuana as a Gateway Drug: The Myth That Will not Die.” (October 2010). TIME. Accessed November 17, 2015. “Speedballing: Why Crack Cocaine and Heroin are Mixed.” (January 2013). Scientific American. Accessed November 17, 2015. “Acute Respiratory Failure From Abused Substances.” (July-August 2004). Journal of Intensive Care Medicine. Accessed November 17, 2015. “Structural Brain Differences in Alcohol-Dependent Individuals With and Without Comorbid Substance Dependence.” (November 2014). Drug and Alcohol Dependence. Accessed November 18, 2015. “Do Drug Companies Make Drugs, or Money?” (June 2014). The New York Times. Accessed November 17, 2015. “Benzodiazepine Abuse.” (n.d.) WebMD. Accessed November 18, 2015. “Recreational Use of Prescription Painkillers Linked to Other Drug Problems in Teens.” (May 2012). TIME. Accessed November 18, 2015. “Your Brain on Alcohol.” (June 2010). Psychology Today. Accessed November 18, 2015. “Toxicological Interactions Between Alcohol and Benzodiazepines.” (2002). Clinical Toxicology. Accessed November 17, 2015. “What Causes Drug Withdrawal?” (December 2014). BrainFacts.org. Accessed November 18, 2015. “Fear and Withdrawal.” (February 2015). The New York Times. Accessed November 18, 2015. “The Perils of Polydrug Abuse.” (April 2009). Addiction Inbox. Accessed November 18, 2015. “Addiction: Part I. Benzodiazepines — Side Effects, Abuse Risks and Alternatives.” (April 2000). American Family Physician. Accessed November 18, 2015. “Number of Americans Taking Antidepressants Doubles.” (August 2009). USA Today. Accessed November 18, 2015. “What Are Antidepressants? How Do Antidepressants Work?” (June 2015). Medical News Today. Accessed November 18, 2015. “Selective Serotonin Reuptake Inhibitors (SSRIs).” (July 2013). Mayo Clinic. Accessed November 18, 2015. “Can I Drink Alcohol If I’m Taking Antidepressants?” (March 2014). National Health Service. Accessed November 18, 2015. “What Are Amphetamines? What Do Amphetamines Do?” (September 2014). Medical News Today. Accessed November 18, 2015. “Effects of Alcohol.” (n.d.) University of Notre Dame. Accessed November 18, 2015. “Dangers of Mixing Adderall & Alcohol.” (September 2014). Healthline. Accessed November 18, 2015. “Health Benefits of Methylxanthines in Cacao and Chocolate.” (October 2013). Nutrients. Accessed November 18, 2015. “Energy Drink Co-Administration Is Associated With Increased Reported Alcohol Ingestion.” (May 2010). Drug and Alcohol Review. Accessed November 18, 2015. “Use Statistics.” (n.d.) Drug Abuse Recognition Training. Accessed November 18, 2015.